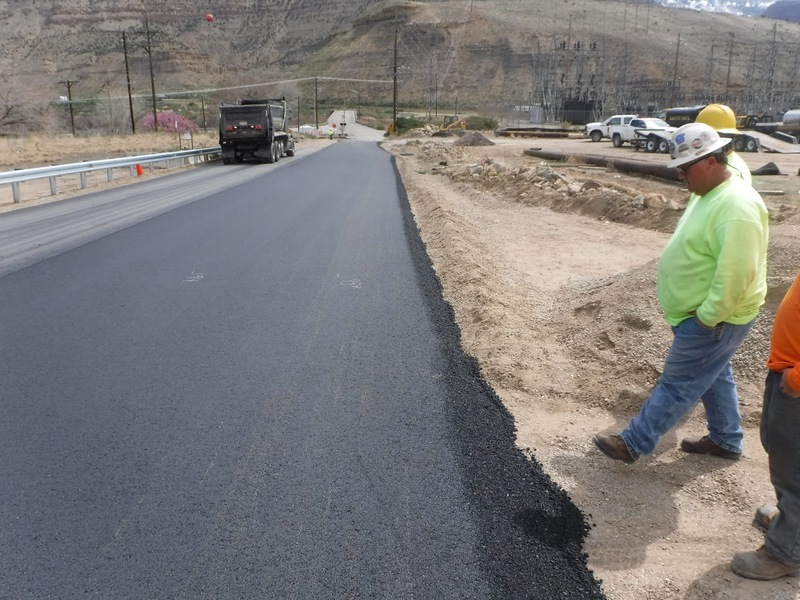 The community is invited to learn about the design to construct a detention basin for Bosley Wash, a mixed desert and agricultural watershed located east and northeast of Grand Junction. The open house aims to share information on the intentions of the project and gather citizen input. Join us Wednesday, April 5 from 3:30 p.m. to 6 p.m. at the Clifton Community Center, 126 2nd Street. Citizens are encouraged to attend the open house and share their thoughts and priorities. Mesa County is anticipating starting construction in summer 2017, and the detention pond is expected to be completed by summer 2018. 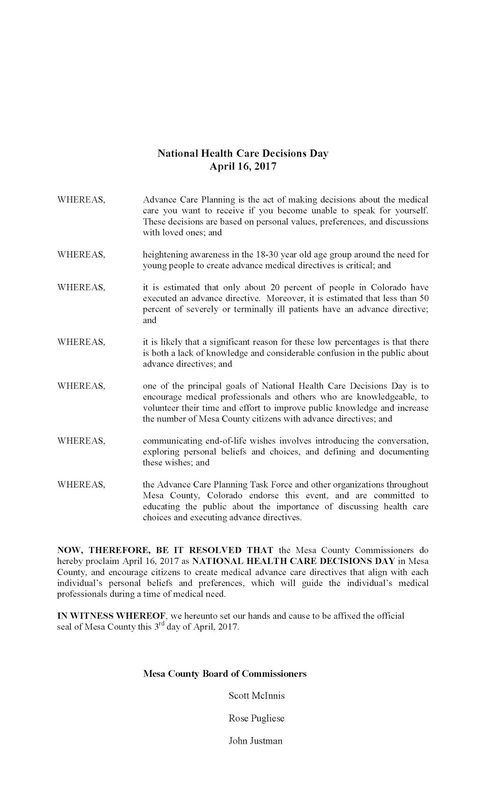 Monday morning at Public Hearing the Mesa County Commissioners proclaimed April 16, 2017, as National Heath Care Decisions Day in Mesa County. National Heath Care Decisions Day creates public awareness and encourages citizens to create medical advance care directives that align with each individual's personal beliefs and preferences, which will guide the individual's medical professionals during a time of medical need. 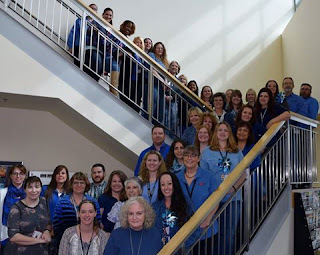 Advance Care Planning is the act of making decisions about the medical care you would like to receive if you become unable to speak for yourself. 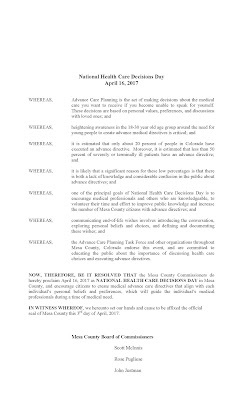 The public is encouraged to attend National Healthcare Decisions Week events beginning Monday, April 17 through Thursday, April 20. For a list of events please click here. 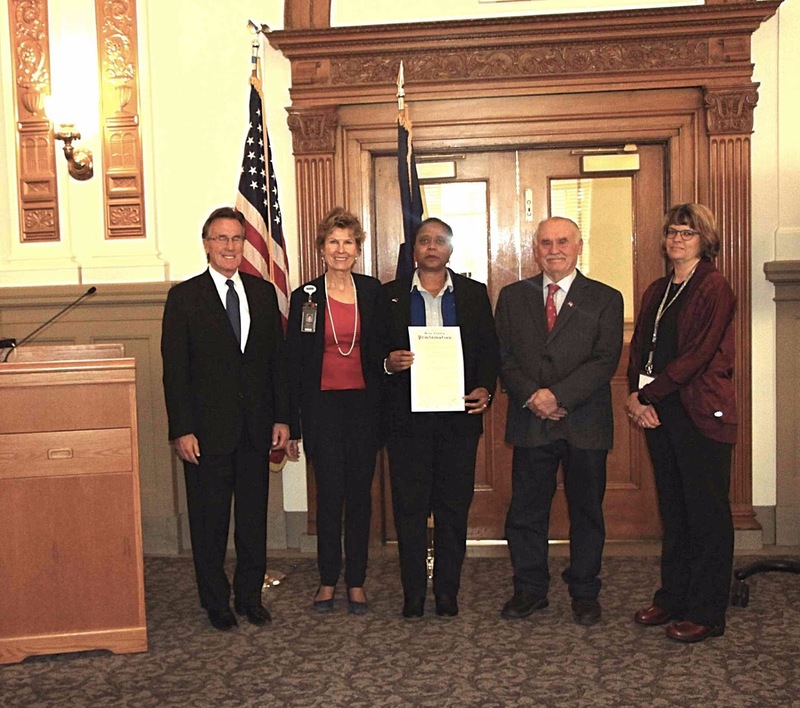 Monday, April 3, 2017, Mesa County Commissioners proclaim April as Child Abuse Prevention Month in Mesa County. All citizens can become involved in efforts to support families, so that children may be raised in a safe, nurturing environment. Preventing child abuse and neglect depends on the involvement of all people in the community. The Mesa County Department of Human Services hopes to raise awareness that effective child abuse prevention succeeds because of partnerships created among social service agencies, families, neighbors, schools, religious organizations, law enforcement agencies and the business community. 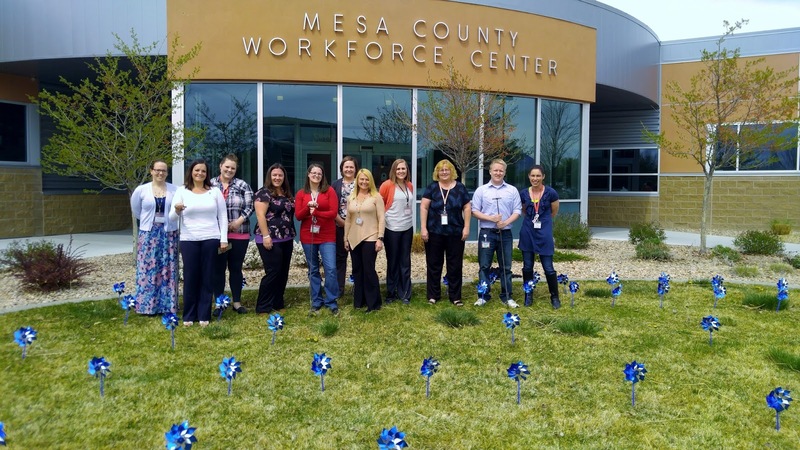 Parents, families and community members can and must help reduce child abuse and neglect in Mesa County by promoting the benefits of seeking out groups, agencies and resources that can assist a parent in providing a loving, supportive and violence-free home. CASA Executive Director Janet Rowland with Kari Daggett the Mesa County Director of family and children. 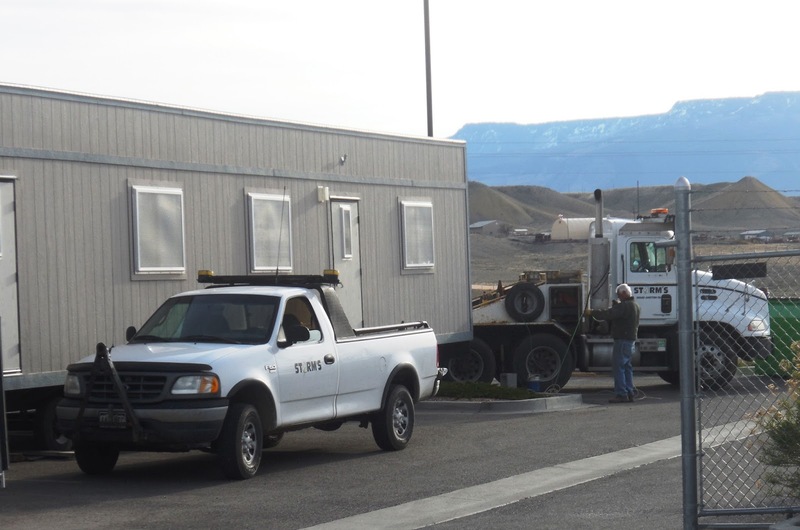 To reduce overtime, Mesa County Solid Waste facilities will close fifteen minutes before the official closing time. This means all landfill users will need to be in the gates before 4:45 p.m. Monday through Friday, and 4:15 p.m. on Saturdays. Compost facility users will need to be in the gates before 4:15 p.m. all week. All customers are asked to be out of the gates by closing (Landfill Closing: 5:00 p.m. Monday- Friday; 4:30 p.m. Saturday. Compost Closing: 4:30 p.m. Monday- Saturday). Monday-Friday 7:00 a.m.to 4:45 p.m., Saturday 8:00 a.m. to 4:15 p.m.
Tuesday-Saturday 8:00 a.m. to 4:15 p.m.
Thursday-Friday 8:00 a.m. to 4:30 p.m., Saturday 8:00 a.m. to 4:15 p.m.